A super simple and refreshing appetizer. Sliced ripe pear with slices of Emmentaler or Jarlsberg or other Swiss cheese. 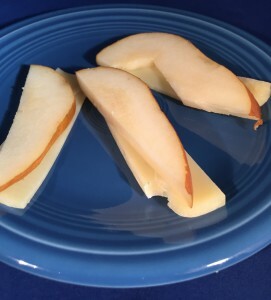 This entry was posted in Appetizers, Recipes, Snacks and tagged kid-friendly. Bookmark the permalink. Both comments and trackbacks are currently closed.